Game day gluten-free pizza is sure to be a winner! The secret? Flavor. Layered on flavor. Layered on flavor. Layered on flavor. No bad fats or processed ingredients. Just fresh herbs, vegetables, and bright flavors that dance together in your mouth. Vegan? Gluten-free? Who knew? Who will care? Probably no one. With all this crazy flavor going on, all anyone will notice is the empty plates. That’s when you got a problem. As I often do, I pulled from my Italian roots for this dish. And since Italian food is the best food in the world, I think you’ll really like it. 🙂 Maybe I’m a little biased. I’m ok with that. When I say layers of flavor I’m not joking. This recipe gets you 3 recipes in one: the Gluten-Free Pizza Dough, the Arugula Pesto, and the Mushroom Onion Sauté. Total score! Keep in mind, you can use the Arugula Pesto on pasta, quinoa (any grain), to top fish or chicken. Feel free to make a double batch while you have the ingredients out. 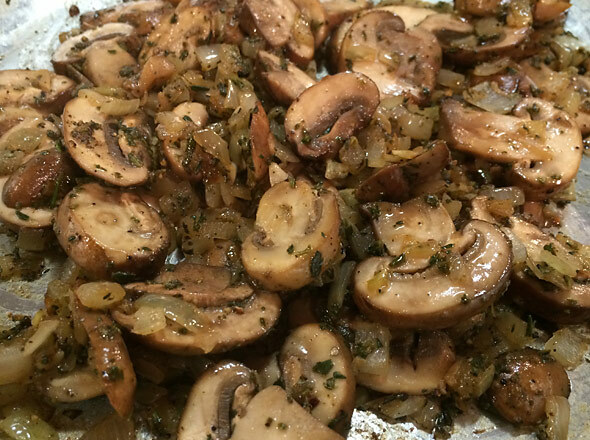 The Mushroom Onion Sauté makes a great side dish to any protein or would add flavor tossed with quinoa, amaranth, rice, any grain! Make a little extra and enjoy the fruits of your labor. What if You’re NOT Vegan or GF? I Got Options Baby! One size usually does not fit all. Not with jeans (Lord knows! ), not even with stretchy yoga pants, not with cars or houses, and certainly not with food. Even though I think we can make gluten-free and vegan food taste so flavorful that most people don’t even notice they are eating it, I know that some people are unfamiliar with the ingredients, and may feel more comfortable cooking with the ones they have. No worries. Pizza Crust: You can sub wheat flour for the gluten-free flour blend in this recipe in a 1:1 ratio. Pizza: You can easily use dairy cheese for the vegan or dairy-free cheese in a 1:1 ratio. Pesto: Grated dairy cheese, grated non-dairy cheese, and vegan ume plum vinegar will all work to give the salty cheese flavor. These tips are based on my observations from working with gluten-free flours versus gluten containing flours. If you have tips of your own to share, don’t be shy! I prefer a superfine gluten-free flour blend to eliminate the gritty texture that gluten-free flours often have. Gluten-free doughs often need help coming together. You might think the mixer hasn’t done it’s job, but before you add more water, feel the dough and see if it’s really dry or if you just need to finish bringing it together with your hands. Gluten-free flours don’t rise as much as gluten containing flours, even when yeasted. They should rise, but they won’t double in size. Make sure you set your dough in a draft free place. I often set mine in the oven. Just don’t turn on the oven (whoops, I’ve baked so many towels! ), unless you have a “proof” setting. If you do, by all means, use it. This will help any yeasted dough rise! I roll my crust out on a Gluten-free designated Silpat, lightly dusted with GF flour. It makes it easier to pick it up with large spatulas to transfer to my pizza grate. I roll my crust thin. This helps the crust bake through in less time without creating that dense, bready experience gluten-free doughs have a bad rep for making. Be patient with rolling out the dough. It won’t be elastic-like because it doesn’t have the gluten. It will roll out, but you may need to piece it together a little bit. Be gentle, work slowly. It will hold! Bake your pizza on a pizza grate, something that lets air come up through the bottom. This will help deliver a crispy crust. YUM. Let your pizza sit for a couple minutes before cutting it. Be gentle when moving it. Cut it with something sharp. I like to top one pizza with fresh arugula and leave one without. Options! Then when I cut my pizzas, I stagger them on the serving dish. I like the way it looks. Mix the warm water and yeast in a small bowl to blend. Let stand until the yeast dissolves and foams, about 5 minutes. Mix the flour and salt in a food processor or stand mixer to blend. With the machine running, add the yeast mixture and blend, let the dough form. If the dough is dry and needs more liquid, add warm water as the mixer or processor runs, 1 tsp at a time until dough comes together. 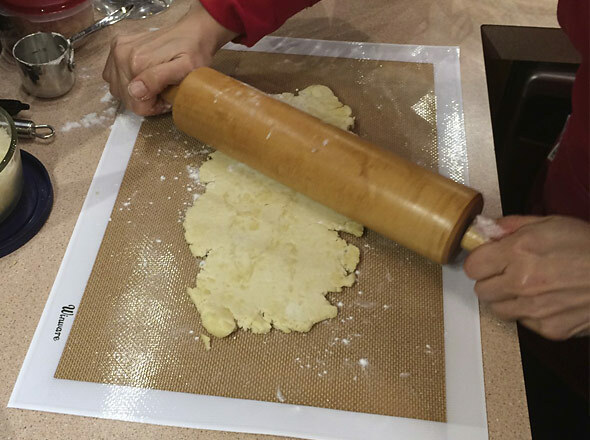 Turn the dough out onto lightly floured surface and knead until smooth, about 1 minute. Transfer the dough to a medium oiled bowl and turn the dough to coat with the oil. After an hour punch the down dough and form into ball. The dough can be used immediately or stored airtight in the refrigerator for 1 day. Mince garlic, thyme and rosemary. Toast almonds at 350 degrees for 5-7 minutes or until golden brown. Portion out cheese to 4 ounces. Set aside. You can make your pesto and sauté and store in the fridge a few days in advance. 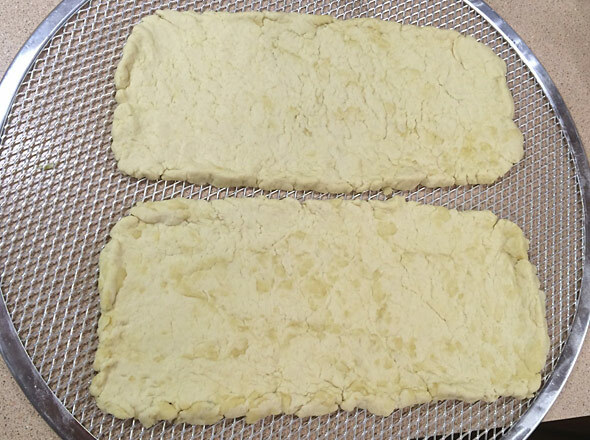 For pizza apps: Roll dough out into two 12"x4" rectangles (give or take). I made the rectangle apps in this recipe. For pizza meal: Roll dough out into one round 13" pizza crust. Spread 3-4 TBS of pesto on each pizza crust. Sprinkle 1 ounce of cheese on top of the pesto on each crust. Then spread half of the mushroom mixture on each pizza. Top with another 1 ounce of cheese on each pizza. Drizzle with slight amount of extra virgin olive oil and pinch of coarse salt and pepper. Bake at 400 degrees for 14-15 minutes, or until light brown. Let pizza sit for a couple minutes before cutting. Option to top with fresh arugula for extra brightness and freshness. *If you aren't Gluten-free, you can sub wheat flour for the gluten-free flour blend in this recipe. 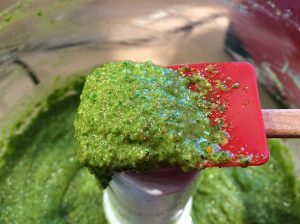 Far more than a pizza topping, arugula pesto tastes great on quinoa, fish, chicken (any grain or protein), and of course, pasta! Put all pesto ingredients except olive oil into a food processor and blend. Stop to scrape sides of bowl. Continue to blend the mixture and add olive oil in a stream through the top of the food processor. Once olive oil is added and pesto is blended, taste and adjust salt and pepper to your taste. Keep in mind, this Mushroom Onion Saute is delish on its own, as a side with quinoa, rice, chicken, turkey, bison – just about anything! In a medium to large sauté pan over medium high heat, add 2 tsp of pure olive oil. Once heated, add your diced onion. Stir and coat with olive oil, let cook for 4-5 minutes. Add garlic, mushrooms, thyme, rosemary and black pepper. Lower heat to medium or medium low, stirring ingredients well. Cook for another 7-8 minutes, stirring occasionally, cooking until onions and mushrooms are tender. Add lemon juice and sea salt. Stir together. Cook for another 1-2 minutes until liquid from lemon juice is reduced. Remove from heat. Taste to adjust seasoning. Set aside. 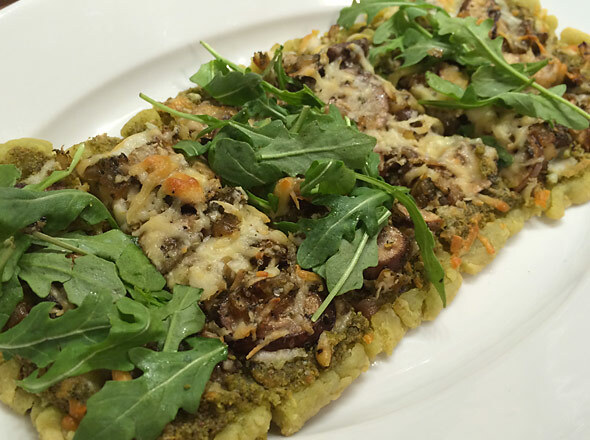 Now all that’s left to do is eat and enjoy this healthy, flavorful, vegan, gluten-free pizza! I love arugula pesto. Great tips for working w/ a gluten free crust! What a unique combination – and both gluten-free and vegan – wow! That’s tough to come by! I’m curious as to why you used ume plum vinegar as a cheese substitution in the pesto – does it offer a similar flavor profile? I love the idea of arugula pesto. This sounds wonderful on a pizza with those mushrooms and onions, Angela. Thanks so much Cindy! I hope you try it! This looks amazing! I’ve been experimenting with gf pizza crust options and I def need to try your recipe. Thanks, Jill! Let me know how it goes. I love trying different recipes. Always so much to learn! How did it go MB?? ?